Newest issue of Reformed Worship is on the 500th anniversary of the Reformation, available here. Several films had been made about Luther over the years. The most recent one, “Luther” was in 2003 and partially funded by Thrivent Financial for Lutherans. It begins when Luther becomes a monk in 1505 and continues to the Diet of Augsburg in 1530. 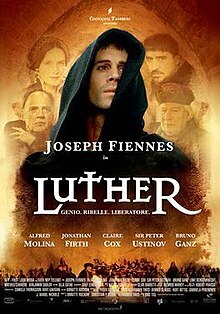 Joseph Fiennes plays Luther with other well-known actors in lesser roles. This film and earlier ones are described on Wikipedia, along with the inaccuracies in each one. Read a little about the newest film due out on PBS later this year, and see other Reformation resources from the Presbyterian Church of Canada here. Reformation 500 is a website of Concordia Seminary in St. Louis, MO. They produced a documentary, “500: The Impact of the Reformation Today.” Go to [email protected] or call 800-822-5287 for more information about these resources. An interesting product, and easily attained, is short film clips that can be found on Youtube describing various aspects resulting from the Reformation. They are from five to eight minutes long and include an introduction, Art in the Reformation, Changing Role of Marriage, Pluralism: Then and Now, Changing Role of Vocation, Changing Role of Money, Usury and Commerce, Bible Translation, Spirituality in the Middle Ages, and Impact of the Reformation Today: An Introduction. Most of the speakers are Concordia faculty, but Martin Marty appears in some. Art from the Middle Ages has a nice visual touch. A fun way to get a quick understanding of the Reformation and what led up to it can be found on Youtube. Take a look below at “Luther and the Protestant Reformation: A Crash Course World History.” Middle school and above would have fun with this.